Every time that I have traveled overseas for more than one week, I have always gone without wearing any nail polish because I find it too much of a hassle to have to take a bottle of nail polish remover because I am paranoid about it bursting in my suitcase and making my clothes smell awful. Luckily Manicare have come to the rescue for people like me and released travel sized nail polish remover pads - genius! I happen to walk past Priceline a couple of days before we left on our honeymoon and noticed that it was half price so I decided to pick one up and try it whilst I am away. As you can see from the pictures above, the nail polish remover pads come in a small round, plastic container so they are the super convenient for taking with you on the go. Each pack comes with 32 nail polish removed pads ready to be used. Unlike conventional nail polish remover, these pads smell great - I purchased the coconut scented ones but I also noticed that you can buy floral scented ones as well. They don't have the awful scent so my husband doesn't have to complain when I do my nails. I noticed that these nail polish remover pads had a bit of a greasy residue and therefore didn't leave my nails feeling dry like normal nail polish remover usually tends to do. Even though there are 32 wipes in the packaging, which might sound like a lot, but wipes are super thin - so, you definitely need more than one to get the job done. I found that I had to use at least 3 wipes in order to remove stubborn red coloured nail polish. Although, I have to say that the wipes work really well in removing all traces of nail polish and that's exactly what I need! 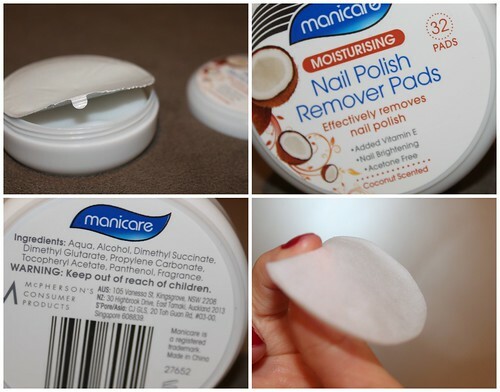 Overall, I have been impressed with these nail polish remover pads from Manicare. They do everything I need them to and are conveniently packaged to use when I am away from home - so I would highly recommend them. These retail at $4.95 at my local Priceline (but I got them for $2.50 during the promotion Priceline had in their catalogue last month). Have you tried these? Did you like them? Neat, I've never seen these before. Thanks for the post! This is an awesome concept and something I would totally use! Agree such a hassle to take the nail polish remove bottle while travelling. But no more! We've seen this product floating around and have been quite curious. It does sound a bit annoying that you have to use quite a few wipes to remove all the nail polish, but it is perfect for travelling. © Copyright 2011 - 2014 Australian Beauty Review Blog. Powered by Blogger.